1. 【HEAVY-DUTY ALUMINUM】--Made by heavy-duty aluminum material to guarantee the sturdy and stable, the max. extension of arm up to 20.5", and the Max. height up to 16.9". 2. 【INSTALLATION METHODS】--C-clamp on the desk edge or grommet mount plus detachable VESA plate, C-clamp fits the thickness between 0.78" and 2.36", grommet diameter fits more than 2.36" (min.). 3. 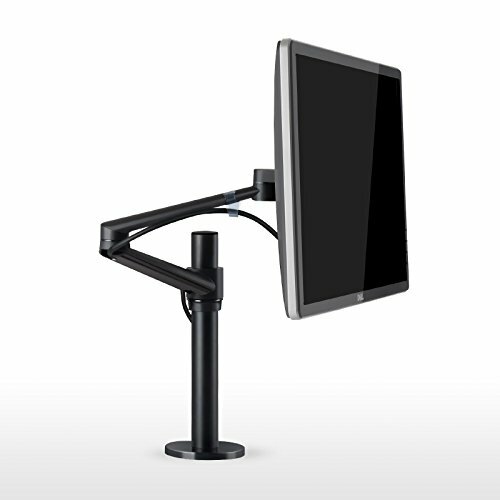 【COMPATIBILITY】--Fits most screens 17"to 32" with VESA 75x75mm or 100x100mm mounting holes, weight capacity: 17.6lbs, including monitor brand Dell, Samsung, HP, BenQ, AOC, Acer, LG, ASUS etc. 4. 【FULLY ADJUSTABLE】--Tilt,rotate and swivel your arm and monitor to multiple comfortable position, effectively reducing the pain and strain on your neck and back. 5. 【CABLE MANAGEMENT】 -- Keep your power and cables clean and organized with detachable cable clips on the arm.